Hey y'all! I'm so excited to be here at Frugal Foodie Mama sharing a delicious & simple dinner idea! Well first I guess I should introduce myself! I'm Jaime, the wife & momma behind Mom's Test Kitchen, my little space in the blogosphere where I share the recipes I make for my family. I also occasionally like to branch outside of my kitchen and share the fun little educational activities that I do with my Princess P.
I have to tell y'all how much I love Carrie's blog! As a stay at home mom, I'm always on the hunt for budget friendly recipes & I love what Carrie comes up with!! One of our favorite low-cost meals is pizza, but not the frozen out of the box kind! We love flatbread pizza!! 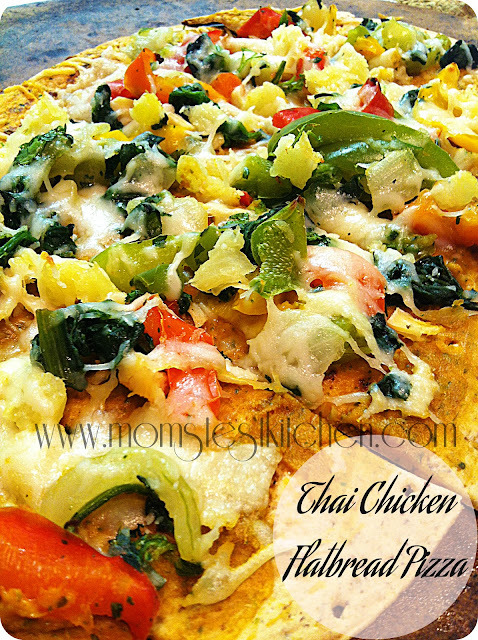 And we love Asian food so I knew I had to try out an Asian inspired pizza!! It was absolutely delicious! This is definitely a pizza we'll be making again!! Place the peanut butter, hot sauce, teriyaki sauce & cilantro in a food processor, blend until smooth. Top the peanut sauce with the chicken, crushed pineapple, onions & peppers, & spinach. Top with mozzarella cheese. Bake for 3-5 minutes or until the cheese has melted. If you like this recipe, I hope you'll stop by & check out some of my others! You can also stay up to date on my newest recipes by joining any of my social network communities! This sounds delicious! What a great idea!!! First off, thanks to Mom's Test kitchen for an awesome recipe. Next I have to tell that your gnome header picture is wicked cool! I am visiting you from the Bloglovin Blog Hop. I am co-hosting it today so thank you for taking part. Please visit me over at A Geek In Glasses! Have a great weekend. Our favorite pizza place does a thai pie... but this loos better! Totally going to give this a try!